The Crystal Strait is made up of multiple islands, each with unique ecosystem that holds different species of monters. When launching an elemental gem, it should successfully linked atleast 3 matching gems! This will release an elemental energy that will deal elemental damage to your enemy! You will deal damage to your enemy if your team line up has the same elemental affinity with the gem's element. The last gem in the chain will become a combo gem. If the combo gem is connected with the two other gems, the chain will continue and perform more combos. The chain combo reaction will end if more than one combo gem is formed. Sometimes, fallen enemies will drop treasures. Be quick to tap and take these treasures as they will gradually disappear. In team panel you can view your team's stats. Enemy has a casting time to attack you. Every enemy attack will reduce your HP. You will lose the battle once your HP runs out. Fortunately, Life Gems contain healing powers! Break these gems to recover HP. There are 5 different kinds of elements - fire water nature light and dark energy. Each monster has an affinity with a specific element. The damage you'll deal depends on the monster's element and your enemy's element. Attacking a monster with an element that is weak to deals double damage. Attacking it with an element that it can resist deals half damage. Keep in this mind! Dark type monsters will suffer double damage from light elemental attacks. How to upgrade a monster? First select a monster first that you would like to upgrade. 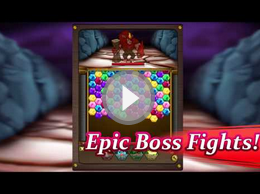 Select another monster to fuse with the monster that you would like to upgrade. Target monster will level up after the fusion. Crushing more than 7 gems will drive your team in a frenzy and will attack all enemies. Howto evolve a monster? When a monster reaches its maximum level, it can be evolved to a much stronger form. Evolving monsters will let them learn new skills so they can grow much more stronger. However we would need to collect the necessary ingredients that will help your monsters evolve. Some monsters have unique skills. Active skills have cooling times. You will be able to use a skill once its countdown is over. Collected magic stones can be used to exchange shells with marina. Marina will ask you for 5 magic stones in exchange for a shell.